What Safety Features Come With the Hyundai Santa Fe? If you are in the market for a crossover SUV, what features do you look for? At Team Hyundai of Bend, many of our consumers like the Hyundai Santa Fe because it comes equipped with a number of features. These include safety features that offer you and your passengers outstanding protection. Let's check out a few below. The Santa Fe comes with Rear Cross-Traffic Collision-Avoidance Assist (RCCA) as a standard safety feature. This feature uses the Blind Spot Detection system's radars to monitor for vehicles that approach from the side when you are reverse. This feature can also apply the brakes automatically when necessary. 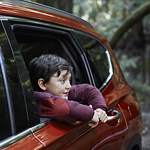 Rear Occupant Alert is an available safety feature that is offered with the Santa Fe. This feature will monitor for pets and children in the rear, and it can send you a reminder to check for your valuables in the back. When you have exited and locked the vehicle, and the system detects movement in the back seat, the horn will sound and you will be notified through your smartphone via the Blue Link connected car system.